Plants grow and wildlife reside in areas where their needs are met. The same ducks that you photograph during one part of the season will not be found when their flight feathers are shed. They will be found in the high grass in the marshes to protect themselves from predators. All wildlife goes through transitions based on the time of the year and different phases of their lives. So, if you are constantly visiting the same area and you don't see that special photo opportunity, stop and think about the time of the year. The rule of thumb is to look for wildlife in transition areas that accommodate shelter, water and food. The most abundant areas that support these elements are in the transition areas of waterways, forests and meadows. These areas also attract smaller animals that in turn attract the predators. 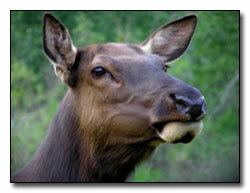 Wildlife reacts the same way that you would during inclement conditions, hot conditions and cold conditions. Think where you would go, based on the weather at the moment, and you will begin to learn to look in all the right places. It will provide dividends for more OE photo opportunities. Read the Art of Seeing section for ways to improve the process of your seeing. Using the Art of Seeing, you will also learn how to look for movement in the outdoors. Wildlife always seems to look smaller than what we visualize when we actually see the animal up close. Sometimes, due to videos or pictures in a book, we have a distorted impression of what size the animal actually is. When looking at the field guides, notice the length and the height of an animal to understand the real size of an animal. Visiting a nature center will improve the visualization of wildlife sizes. Note, most wildlife is seen by looking down in brush or bushes... not looking over. When you locate wildlife, you will be extremely fortunate if the whole animal is seen initially.